There has been a great deal of debate regarding Taylor rules recently. The U.S. House of Representatives recently proposed a bill that would require the Federal Reserve to articulate their policy in the form of a rule, such as the Taylor Rule. This bill created some debate about whether or not the Federal Reserve should adopt the Taylor Rule or not. In reality, the bill did not require the Federal Reserve to adopt the Taylor Rule, but rather used the Taylor Rule as an example. In addition, John Taylor has been advocating the Taylor Rule as a guide to policy recently as well as attributing the recent financial crisis/recession to the deviations from the Taylor Rule. While it should not surprise anyone that Taylor has been advocating a rule of his own design and which bears his name, he has faced criticism regarding his recent advocacy of the rule and his views on the financial crisis. Let me begin with a mini history of monetary policy in the United States during the past 50 years. When I first started doing monetary economics in the late 1960s and 1970s, monetary policy was highly discretionary and interventionist. It went from boom to bust and back again, repeatedly falling behind the curve, and then over-reacting. The Fed had lofty goals but no consistent strategy. If you measure macroeconomic performance as I do by both price stability and output stability, the results were terrible. Unemployment and inflation both rose. Then in the early 1980s policy changed. It became more focused, more systematic, more rules-based, and it stayed that way through the 1990s and into the start of this century. Using the same performance measures, the results were excellent. Inflation and unemployment both came down. We got the Great Moderation, or the NICE period (non-inflationary consistently expansionary) as Mervyn King put it. Researchers like John Judd and Glenn Rudebush at the San Francisco Fed and Richard Clarida, Mark Gertler and Jordi Gali showed that this improved performance was closely associated with more rules-based policy, which they defined as systematic changes in the instrument of policy — the federal funds rate — in response to developments in the economy. But then there was a setback. The Fed decided to hold the interest rate very low during 2003-2005, thereby deviating from the rules-based policy that worked well during the Great Moderation. You do not need policy rules to see the change: With the inflation rate around 2%, the federal funds rate was only 1% in 2003, compared with 5.5% in 1997 when the inflation rate was also about 2%. The results were not good. In my view this policy change brought on a search for yield, excesses in the housing market, and, along with a regulatory process which broke rules for safety and soundness, was a key factor in the financial crisis and the Great Recession. This deviation from rules-based monetary policy went beyond the United States, as first pointed out by researchers at the OECD, and is now obvious to any observer. Central banks followed each other down through extra low interest rates in 2003-2005 and more recently through quantitative easing. QE in the US was followed by QE in Japan and by QE in the Eurozone with exchange rates moving as expected in each case. Researchers at the BIS showed the deviation went beyond OECD and called it the Global Great Deviation. Rich Clarida commented that “QE begets QE!” Complaints about spillover and pleas for coordination grew. NICE ended in both senses of the word. World monetary policy now seems to have moved into a strategy-free zone. This short history demonstrates that shifts toward and away from steady predictable monetary policy have made a great deal of difference for the performance of the economy, just as basic macroeconomic theory tells us. This history has now been corroborated by David Papell and his colleagues using modern statistical methods. Allan Meltzer found nearly the same thing in his more detailed monetary history of the Fed. My reading of this suggests that there are two important points that we can learn about Taylor’s view. First, Taylor’s view of the Great Moderation is actually quite different than the New Keynesian consensus — even though he seems to think that they are quite similar. The typical New Keynesian story about the Great Moderation is that prior to 1979, the Federal Reserve failed to follow the Taylor principle (i.e. raise the nominal interest rate more than one-for-one with an increase in inflation, or in other words, raise the real interest rate when inflation rises). In contrast, Taylor’s view seems to be that the Federal Reserve became more rule-based. However, a Taylor rule with different parameters than Taylor’s original rule can still be consistent with rule-based policy. So what Taylor seems to mean is that if we look at the federal funds rate before and after 1979, it seems to be consistent with his proposed Taylor Rule in the latter period, but there are significant deviations from that rule in the former period. This brings me to the second point. Taylor’s view about the importance of the Taylor Rule is one based on empirical observation. What this means is that his view is quite different from those working in the New Keynesian wing of the optimal monetary policy literature. To see how Taylor’s view is different from the New Keynesian literature, we need to consider two things that Taylor published in 1993. The first source that we need to consult is Taylor’s book, Macroeconomic Policy in a World Economy. In that book Taylor presents a rational expectations model and in the latter chapters uses the model to compare monetary policy rules that look at inflation, real output, and nominal income. He finds that the preferred monetary policy rule in the countries that he considers is akin to what we would now call a Taylor Rule. In other words, the policy that reduces the variance of output and inflation is a rule that responds to both inflation and the output gap. 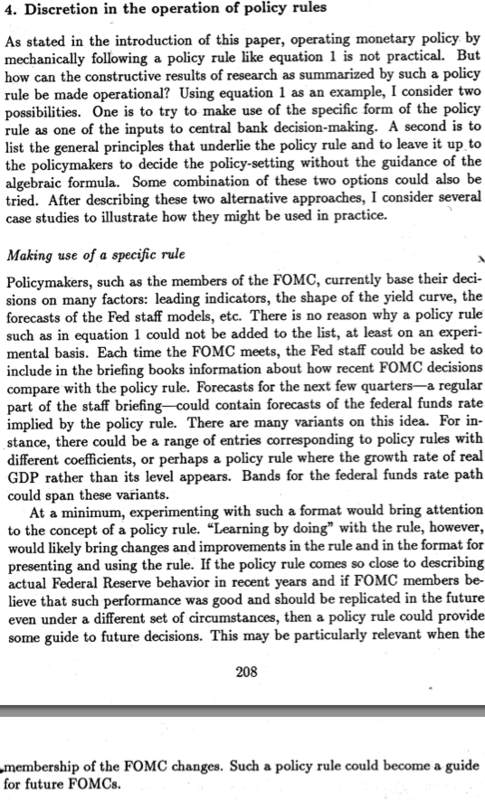 Thus, as we can see in the excerpt from Taylor’s paper, the reason that he finds this particular policy rule desirable is that it seems to describe monetary policy during a time in which policymakers seemed to be doing well. Indeed, Taylor’s views on monetary policy do not seem to have changed much from his 1993 paper. He still advocates using the Taylor Rule as a guide to monetary policy rather than as a formula required for monetary policy. However, what is most important is the following distinction between Taylor’s 1993 book and Taylor’s 1993 paper. 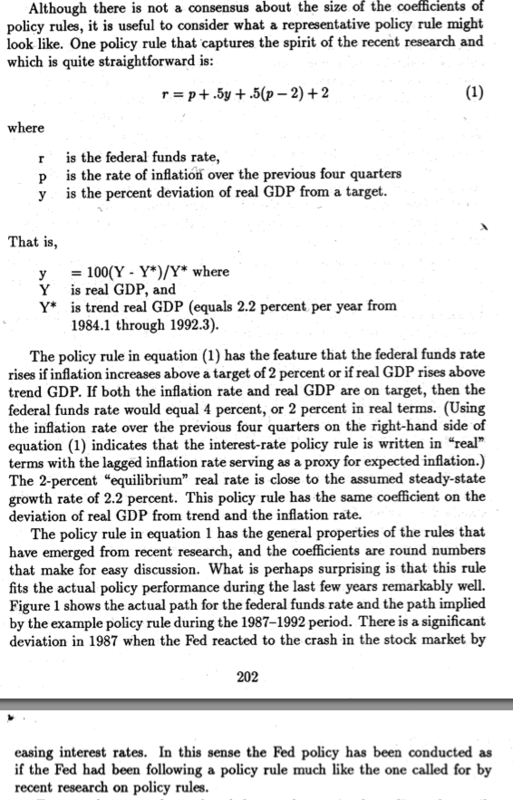 In his book, Taylor shows using evidence from simulations that a feedback rule for monetary policy in which the central bank responds to inflation and the output gap (rather than inflation itself or nominal income) is the preferable policy among the three alternatives he considers. In contrast, in his 1993 paper, we begin to see that Taylor views the version of the rule in which the coefficient on inflation is 1.5 and the coefficient on the output gap is 0.5 as a useful benchmark for policy because it seems to describe policy well between the period 1987 – 1992 — a period that Taylor would classify as good policy. In other words, Taylor’s advocacy of the conventional 1.5/0.5 Taylor Rule seems to be informed by the empirical observation that when policy is good, it also tends to coincide with this rule. This is also evident in Taylor’s 1999 paper entitled, “A Historical Analysis of Monetary Policy Rules.” In this paper, Taylor does two things. First, he estimates reaction functions for the Federal Reserve to determine the effect of inflation and the output gap on the federal funds rate. In doing so, he shows that the Greenspan era seems to have produced a policy consistent with the conventional 1.5/0.5 version of the Taylor Rule whereas for the pre-1979 period, this was not the case. Again, this provides Taylor with some evidence that when Federal Reserve policy is approximately consistent with the conventional Taylor Rule, the corresponding macroeconomic outcomes seem to be better. This is best illustrated by the second thing that Taylor does in the paper. In the last section of the paper, Taylor plots the path of the federal funds rate if monetary policy had followed a Taylor rule and the actual federal funds rate for the same two eras described above. What the plots of the data show is that during the 1970s, when inflation was high and when nobody would really consider macroeconomic outcomes desirable, the Federal Reserve systematically set the federal funds rate below where they would have set it had they been following the Taylor Rule. In contrast, when Taylor plots the federal funds rate implied by the conventional Taylor Rule and the actual federal funds rate for the Greenspan era (in which inflation was low and the variance of the output gap was low), he finds that policy is very consistent with the Taylor Rule. …if one defines policy mistakes as deviations from such a good policy rule, then such mistakes have been associated with either high and prolonged inflation or drawn-out periods of low capacity utilization, much as simple monetary theory would predict. (Taylor, 1999: 340). Thus, when we think about John Taylor’s position, we should recognize that Taylor’s position on monetary policy and the Taylor Rule is driven much more by empirical evidence than it is by model simulations. He sees periods of good policy as largely consistent with the conventional Taylor Rule and periods of bad policy as inconsistent with the conventional Taylor Rule. This reinforces his view that the Taylor Rule is a good indicator about the stance of monetary policy. Taylor’s advocacy of the Taylor Rule as a guide for monetary policy is very different from the related New Keynesian literature on optimal monetary policy. That literature, beginning with Rotemberg and Woodford (1999) — incidentally writing in the same volume as Taylor’s 1999 paper, which was edited by Taylor — derives welfare criteria using the utility function of the representative agent in the New Keynesian model. In the context of these models, it is straightforward to show that the optimal monetary policy is one that minimizes the weighted sum of the variance of inflation and the variance of the output gap. …if you take a modern macro model and work out what is the optimal Taylor Rule – tune the coefficients so that they maximise social welfare, properly defined in model terms, you will get very large coefficients on the term in inflation. Perhaps an order of magnitude greater than JT’s. This same result is manifest in ‘pure’ optimal policies, where we don’t try to calculate the best Taylor Rule, but we calculate the best interest rate scheme in general. In such a model, interest rates are ludicrously volatile. This lead to the common practice of including terms in interest rate volatility in the criterion function that we used to judge policy. Doing that dials down interest rate volatility. Or, in the exercise where we try to find the best Taylor Rule, it dials down the inflation coefficient to something reasonable. This pointed to a huge disconnect between what the models were suggesting should happen, and what central banks were actually doing to tame inflation [and what John Taylor was saying they should do]. JT points out that most agree that the response to inflation should be greater than one for one. But should it be less than 20? Without an entirely arbitary term penalising interest rate volatility, it’s possible to get that answer. I suspect that if one brought up this point to Taylor, he would suggest that these fine-tuned coefficients are unreasonable. As evidence in favor of his position, he would cite the empirical observations discussed above. Thus, there is a disconnect between what the Taylor Rule literature has to say about Taylor Rules and what John Taylor has to say about Taylor Rules. I suspect the difference is that the literature is primarily based on considering optimal monetary policy in terms of a theoretical model whereas John Taylor’s advocacy of the Taylor Rule is based on his own empirical observations. Nonetheless, as Tony pointed out to me in conversation, if that is indeed the position that Taylor would take, then quotes like this from Taylor’s recent WSJ op-ed are misleading, “The summary is accurate except for the suggestion that I put the rule forth simply as a description of past policy when in fact the rule emerged from years of research on optimal monetary policy.” I think that what Taylor is really saying is that Taylor Rules, defined generally as rules in which the central bank adjusts the interest rate to changes in inflation and the output gap, are consistent with optimal policy rather than arguing that his exact Taylor Rule is the optimal policy in these models. Nonetheless, I agree with Tony that this statement is misleading regardless of what Taylor meant when he wrote it. But suppose that we give Taylor the benefit of doubt and suggest that this statement was unintentionally misleading. There is still this bit about the financial crisis to discuss and it is on this subject that there are questions that need to be asked of Taylor. In Taylor’s book Getting Off Track, he argues that deviations from the Taylor Rule caused the financial crisis. To demonstrate this, he first shows that from 2003 – 2006, the federal funds rates was approximately 2 percentage points below the rate implied by the conventional Taylor Rule. He then provides empirical evidence regarding the effects of the deviations from the Taylor Rule on housing starts. He constructs a counterfactual to suggest that if the Federal Reserve had followed the Taylor Rule, then then housing starts would have been between 200,000 – 400,000 units lower each year between 2003 and 2006 than what we actually observed. He also shows that the deviations from the Taylor Rule in Europe can explain changes in housing investment in for a sample that includes Germany, Austria, Italy, the Netherlands, Belgium, Finland, France, Spain, Greece, and Ireland. Taylor therefore argues that by keeping interest rates too low for too long, the Federal Reserve (and the ECB by following suit with low interest rates) created the housing boom that ultimately went bust and led to a financial crisis. 2. John’s rule was shown to deliver pretty good results in variations on a narrow class of DSGE models. The crisis has cast much doubt on whether this class is wide enough to embrace the truth. In particular, it typically left out the financial sector. Modifications of the rule such that central bank rates respond to spreads can be shown to deliver good results in prototype financial-inclusive DSGE models. But these models are just a beginning, and certainly not the last word, on how to describe the financial sector. In models in which the Taylor Rule was shown to be good, smallish deviations from it don’t cause financial crises, therefore, because almost none of these models articulate anything that causes a financial crisis. How can you put a financial crisis in real life down to departures from a rule whose benefits were derived in a model that had no finance? There is a story to be told. But it requires much alteration of the original model. Perhaps nominal illusion; misapprehension of risk, learning, and runs. And who knows what the best monetary policy would be in that model. 3. In the models in which the TR is shown to be good, the effects of monetary policy are small and relatively short-lived. To most in the macro profession, the financial crisis looks like a real phenomenon, building up over 2-2.5 decades, accompanying relative nominal stability. Such phenomena don’t have monetary causes, at least not seen through the spectacles of models in which the TR does well. Conversely, if monetary policy is deduced to have two decade long impulses, then we must revise our view about the efficacy of the Taylor Rule. Thus, we are back to the literature on optimal monetary policy. Again, I suspect that if one raised these points to John Taylor, he might argue that (i) his empirical evidence on the financial crisis trumps the optimal policy literature (which admittedly has issues — like the lack of a financial sector in my of these models), (ii) his empirical analysis suggests that a Taylor Rule might be optimal in a properly modified model, or (iii) regardless of whether the conventional Taylor Rule is optimal, the deviation from this type of policy is harmful as evident by the empirical evidence. 1. Suppose that Taylor believes that point (i) is true. If this is the case, then citing the optimal monetary policy literature as supportive of the Taylor Rule in the WSJ is not simply innocently misleading the readers, it is deliberately misleading the readers by choosing to only cite this literature when it fits with his view. One should not selectively cite literature when it is favorable to one’s view and then not cite the same literature when it is no longer favorable. 2. As Tony Yates points out, point (ii) is impossible to answer. 3. Regarding point (iii), the question is whether or not empirical evidence is sufficient to establish the Taylor Rule as a desirable policy. For example, as the work of Athanasios Orphanides demonstrates, the conclusions about whether the Federal Reserve following the Taylor principle (i.e. having a coefficient on inflation greater than 1) in the pre- and post-Volcker era are dependent upon the data that one uses in their analysis. When one uses the data that the Federal Reserve had in real-time, the problems associated with policy have more to do with the responsiveness of the Fed to the output gap than they do with the rate of inflation. In other words, the Federal Reserve does not typically do a good job forecasting the output gap in real-time. This is a critical flaw in the Taylor Rule because it implies that even if the Taylor Rule is optimal, the central bank might not be able to set policy consistent with the rule. In other words, if the deviations from the Taylor Rule have such a large effect on economic outcomes and it is very difficult for the central bank to maintain a policy consistent with the Taylor Rule, then perhaps this isn’t a desirable policy after all. 4. One has to stake out a position regarding where they stand on models and the data. Taylor’s initial advocacy of this type of rule seems to be driven by the model simulations that he has done. However, his more recent advocacy of this type of rule seems to be driven by the empirical evidence in his 1993 and 1999 papers and his book, Getting Off Track. But the empirical evidence should be consistent with the model simulations and it is not clear that this is true. In other words, one should not make statements about the empirical importance of a rule when the outcome from deviating from that rule is not even a feature of the model that was used to do the simulations. 5. In addition, the Taylor Rule lacks the intuition of, say, a money growth rule. With a money growth rule, the analysis is simply based on quantity theoretic arguments. If one targets a particular rate of growth in the monetary aggregate (assuming that velocity is stable), we have a good idea about what nominal income growth (or inflation) will be. In addition, the quantity theory is well known (if not always well understood) and can be shown to be consistent with a large number of models (even models with flexible prices). This sort of rule for policy is intuitive. If you know that in the long run money growth causes inflation then the way to prevent inflation is to limit money growth. It is not so clear what the intuition is behind the Taylor Rule. It says that we need to tighten policy when inflation rises and/or when real GDP is above potential. That part is fairly intuitive. But what are the “correct” parameters? And why is Taylor’s preferred parameterization such a good rule? Is it solely based on his empirical work because the optimal monetary policy literature suggests alternatives? 6. Why did things change between the 1970s and the early 2000s. In his 1999 paper, Taylor argues that the Federal Reserve kept interest rates too low for too long and we ended up with stagflation. In his book Getting Off Track, he implies that when the Federal Reserve kept interest rates too low for too long we ended up with a housing boom and bust. But why wasn’t there inflation/stagflation? Why was there such a different response to having interest rates too low in the early 2000s as opposed to the 1970s? These are questions that empirics alone cannot answer. In any event, I hope that this post brings some clarity to the debate. Sometimes while you are proctoring exams, you realize that an episode of Seinfeld can be understood as an optimal stopping time problem and you write a short paper about it. Enjoy. The conventional way of discussing monetary policy is by referencing the interest rate target of the central bank. This is also the way that monetary policy is communicated in the basic New Keynesian model. The idea is that the transmission of monetary policy is primarily through the interest rate. I would like to argue in this post that this is a problematic way of thinking about monetary policy and that the transmission mechanism of policy is unclear. In the New Keynesian model, the real interest rate affects the time path of consumption through the consumption Euler equation. In particular, when the real interest rate falls, the household would want to save less and therefore would want to consume more. This increases real economic activity in the current period. If we add capital to the model, a lower interest rate encourages a greater investment in capital. Thus, if monetary policy can affect the real interest rate in the short run, then the interest rate target of the central bank can be used as a stabilization tool. This investment mechanism, however, is questionable. It ignores how investment is actually done in the real world. We can illustrate this lesson with a simple example. Assuming that (i.e. the optimal time to invest is not immediately), it is straightforward to see that when the real interest rate declines, it is beneficial to put off the investment further into the future. We can understand the intuition behind this result as follows. In a standard model with capital, the marginal product of capital (net of some adjustment cost) is equal to the real interest rate. Thus, when the real interest rate falls, the firm wants to increase its investment in capital, but because it is costly to adjust that capital, it takes time for the capital stock to reach the firm’s desired level. In contrast, the framework presented above suggests that investment is an option and the firm has to decide when to exercise that option. In that case, a lower the real interest rate means that the future is more important (all else equal). But if the future is more important, then that increases the opportunity cost of exercising the option today. So the firm would want to wait to exercise the option. So which way is best to think about interest rates and investment? The empirical evidence on the issue (albeit somewhat dated) seems to suggest that price variables, like the real interest rate, are not particularly useful in explaining investment (at least compared to other variables). So is this really the mechanism that should be emphasized in the conduct of monetary policy?